You would like to watch your favorite home video using a mobile phone? AVS Video Converter enables you to convert your home video to a necessary format and then upload it to the mobile phone using special application. Now AVS Video Converter uses AVS Mobile Uploader included in the AVS Video Converter installation package to upload the files to your mobile phone. Palm for Palm Pre, Palm Pixi, Palm Treo. The full list of supported devices you can see here. Note: you can also use the Formats tab of the Main Toolbar and select the To MP4 button for mobile phones with MPEG-4 video support or the To 3GP button for mobile phones with 3GPP and 3GP2 video support (click the More Formats button to open the More Formats Toolbar, if needed). In the list of Profiles (Profile field) select one of the profiles offered for the chosen type of mobile phone. You can also click the Advanced >> button to manually set the profile parameters in the Output File section of the opened Conversion Options tab. Turn on your phone and connect it to your computer via USB, Infrared or Bluetooth. 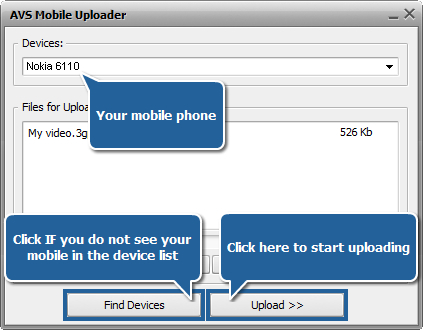 The AVS Mobile Uploader application will be launched to guide you through the upload process so that you could send your converted video file to your phone. Now you can enjoy your favorite home video DVD and video files on your mobile phone!